Wouldn’t you prefer visitors who are interested in what you offer? 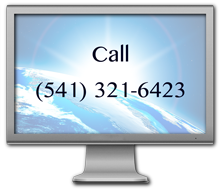 Pay Per Click Marketing allows you to target audiences who are actively seeking your product or service. 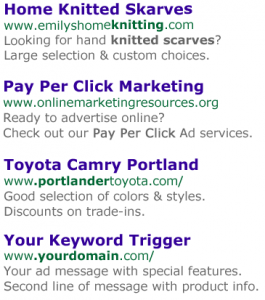 This advertising model is unique to the search engine system on the Internet, and moves from a broadcast to a targeted mode of distributing messages. Media outlets boast about the large numbers of audiences they reach, and their advertising rates are based on these numbers. But, think about those billboards, newspaper and magazine ads, TV and radio spots! What percentage of people who see them actually become customers? A very small number! Most people who see a car ad on TV are not in the market for a car. But when they ARE in the market, one of the tools they use for gathering information is the Internet. And when they plug in a search term like “new toyota camry” they get information and ads for the Toyota Camry. 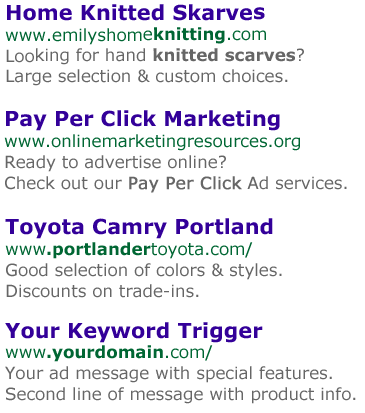 When they search for “home knitted scarf” they get ads for businesses that create knitted scarves.